I got home at almost 8 last night, and within a half hour I was upstairs reading Desperaux to the child (we've been doing two or three chapters a night). I then tucked her in, and left her contemplating what was going to happen next - "is Mig going to cut open the Princess?" she asked as I escaped down the stairs. All was quiet as we ate our farfalle with homemade red sauce. All was quiet as I puttered around on the computer. All was quiet when I went upstairs to put myself to bed, whereupon I found that the quiet had been deceptive. 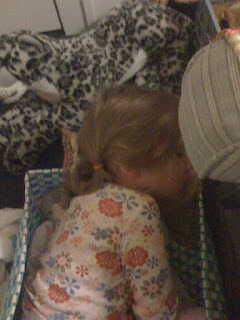 She'd constructed a fort for some of the dolls and animals, tucked others in on their throw pillow beds, dumped all of the animals out of the storage box, squished her bed pillow into the box, and curled herself up into the storage box. See her there, between the chair and its cushion? It's one of those situations where you just don't know whether to laugh or to cry, so you take a picture. And then you scoop her up and put her back in her bed. did she fall asleep with the light on, or did you turn it on for the picture? I think that was the right choice..what a sweet story! Omigosh, omigosh, omigosh! I have the EXACT SAME storage boxes! Except mine aren't nearly as gargantuan. Like, I mean, the cat might fit in mine, but not a sleeping child. So, please, please, tell me where I can find some huge-normous ones. Oh, wait. That wasn't the point of your story? Aw! That is SO something Red would do! I was just now jotting down a note to write about how her new bedtime routine's going and it wouldn't suprise me to discover she's channeling your daughter's urge to build a nest. Miss M is just so remarkably wonderful! I needed a story like this tonight. Oh, she fell asleep like that. Precious girl. looking at that picture i suddenly remembered what it was to have a small body that found magic (rather than joint pain) in curling up into tiny, cozy nooks created by imagination. I sometimes want to snuzzle up in a teeny space like that. I second Bon's sentiment exactly. Imagination is a magical thing. That's such a precious picture. 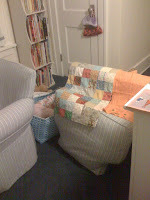 My daughter is into building forts right now, too. She takes off couch cushions, comforters off the bed, etc. Taking a picture was definitely the right choice. MQ often stays up and plays after bedtime. Mostly we let her (my theory is, as long as she doesn't bug me she'll sleep when she needs to) The other day she had just received a new sutffed animal (from the leprechauns on St Patty's day!) and was up introducing it to all her old animals. it was adorable! I felt that way reading Desperaux in my late 30s but I was pregnant and no box would contain me. It's amazing to watch, isn't it? The effect of art on imagination--frightening and endearing and nostalgic all rolled into one. She is just too cute for words. We do have to get together again soon. You know, that initiative that makes it hard to keep the house clean, get them into bed, etc. is what's going to give them exciting and interesting lives. she's really a cat in a human body, right? at least for now? i LOVE LOVE this about children. these are the moments that make me crazy with joy. so cute. That is adorable. KayTar never used to sleep anywhere except her crib/bed. Now I find her asleep in all sorts of odd places! That is so totally priceless! Thanks for sharing the picture. what a sweetheart. so cute.